“Baby, I’m for Real” is a soul balladwritten by Marvin Gaye and Anna Gordy Gaye, produced by Marvin and recorded and released by American Motown vocal group The Originals for the Soul label issued in 1969. 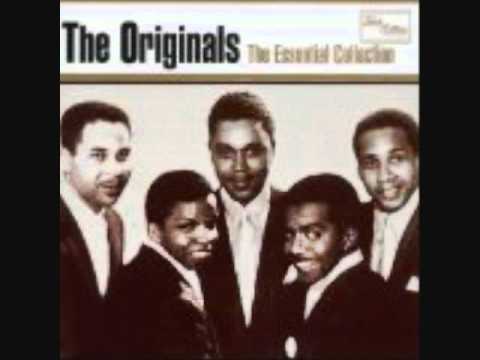 By the late sixties, male vocal quintet the Originals had been recording mostly background vocals for Motown artists most notably backing up brothers Jimmy Ruffin (“What Becomes of the Brokenhearted“) and David Ruffin (“My Whole World Ended (The Moment You Left Me)“) respectively. They also were as known for providing background vocals to some of Marvin Gaye‘s late sixties recordings such as “Chained“. But their own singles up until then had failed to generate interest. Having befriended Gaye during recording sessions, the singer promised the group that he’ll find them the hit they were searching for. With music written with his wife Anna, Marvin wrote the lyrics to a song called “The Bells I Hear” by Bobby Taylor with The Originals taking the place of The Vancouvers as background vocalists. Different from most Motown recordings of the period, directed by the psychedelic soulproductions of Norman Whitfield, the song was a return to a back-to-basics doo-wop inspired approach which was championed by Gaye, who took creative control of the recording as the song’s producer. Shelving the song and rewriting it as “Baby I’m For Real” and its follow-up “The Bells”, Gaye had each member of the band provide a lead vocal on each of the verses while also singing along in the background. The singer would also produce another song titled “You’re the One”. While that song failed to chart, he pushed ahead for “…Real”. Gaye had protested to Motown CEO Berry Gordy that he wanted to produce his own material and he used the Originals to help get his point across that he can provide a hit as he eventually did for the Originals as “Baby I’m For Real” reached number one on the Billboard Top Black Singles chart and reached number fourteen on the Pop Singles chart,. eventually selling over a million copies and putting the Originals on the map for a brief period as recording artists. The song’s success paved the way for two more successful Gaye-helmed productions: the follow-up “The Bells” (1970) and “We Can Make It, Baby”. Dorsey’s songs have been covered by artists as diverse as Petula Clark and Johnny Hallyday (“Ya Ya Twist”, a 1962 French version of “Ya Ya”) and Devo(“Working in the Coal Mine”). “Ya Ya” was covered on John Lennon’s Rock ‘n’ Roll album. “Get Out of My Life, Woman” (1966) was performed often by the Byrds (who based their instrumental “Captain Soul” on it), the Jerry Garcia Band, also predated the boom bap beat of the 90s Hip Hop; and Robert Palmerhad a hit with “Sneakin’ Sally Through The Alley”. His version of the Allen Toussaint song “Everything I Do Gonh Be Funky (From Now On)” is referenced in the Beastie Boys’ song “Sure Shot”, with the lyric “Everything I do is funky like Lee Dorsey.” “Ya Ya” was spoken by Cheech Marin in Cheech and Chong’s Next Movie, as he was waiting for his girlfriend.